Heavy duty hardened steel, with skidproof easy grip rubber handle and a spoon end that's perfect for easy removal of tires. Tools are about 11.5" long, smooth rounded edges,easy to use and without pinching your innertube. Great for someone that has more than one motorcycle and wants to save on price of tire changing. The 11.5 inch length allows for the leverage you need to get the tire on and off the rim. A rim protector of some kind is a nice addition. 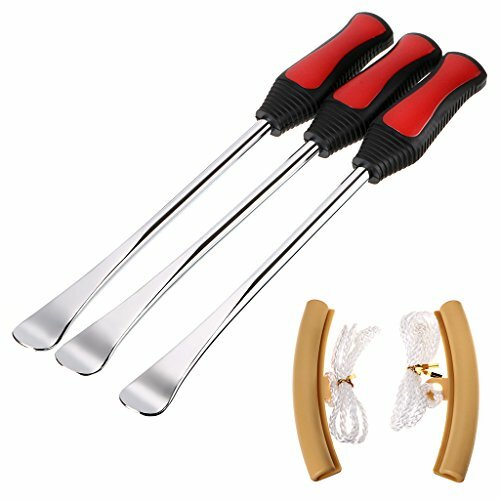 Package include the 3 pieces of 11.5" Spoon levers and 2 rim protector. Changing a tire often requires more than one tire iron, so package includes three Tire Irons, and you can leave one as backup. These tools are perfect for motorcycle/bike tire changes. Any problem, welcome to send us the email.